Thank you for joining me as we count down to the next MFT release. We are three days away from the big day! All the new Stamps, Die-namics, and Stencils will be available on Tuesday, January 5 at 10:00 pm EST. Be sure to check out the MFT Blog to see all the new items being revealed today. Don't forget to leave a comment on the MFT Blog countdown posts, YOU could win one of the five $75.00 gift vouchers. My card today features the gorgeous new set, Sketched Blooms and the fabulous Wonky Stitched Rectangle STAX Die-namics. The Sketched Blooms stamp set is actually a two steep style stamp set which includes the line art stamps and the solid stamps. I decided to just use the line stamps on this card. I stamped the images on a piece of watercolour paper with Black Licorice Hybrid Ink. and I coloured the flowers using Zig pens and a water brush. The sentiment was stamped on a Stitched Fishtail Flag it is from the Love You More stamp set. So pretty, I love my zig pens! I like the idea of all the flowers in one color, awesome job! This MFT stamp set is my happy. Beautiful designed card and awesome colors. Beautiful!!! WOW! I need to tutor at someone's knee!!!! Your card is so vibrant. I love the colors of your flowers, they really pop. Thanks for sharing. Pow!! This card speaks! Awesome! 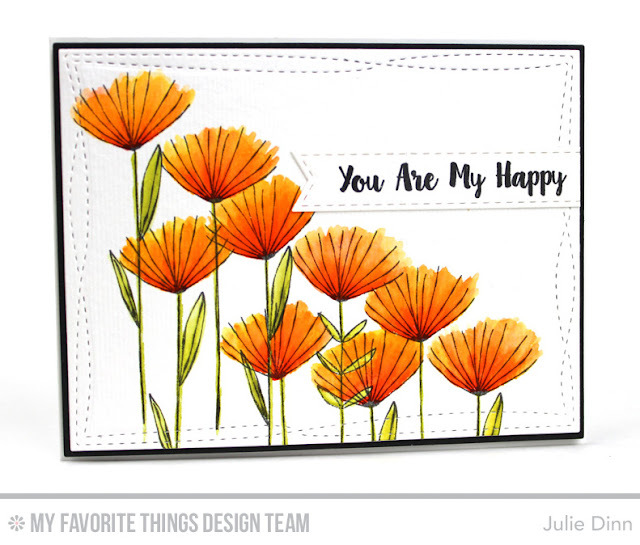 This IS a gorgeous set Julie as is your card! Just lovely. Can't wait to see what you ladies do with the new release! Sweet and simple. Love your happy colors! This is absolutely gorgeous... I cannot wait until these products are available. Your work is stunning. Thanks so much for sharing. I LOVE how you used this set, your flowers turned out beautifully!! you create a beautiful garden!!! Love the color of your flowers! Beautiful card! Love the vivid orange color!